The Moon is always full of surprises! I have been making simple observations of it for almost thirty years, and they have allowed me to get pretty accurate values of the synodic and sidereal months. These involved just naked-eye observations. More recently I have been using photographic methods, first to measure how the angular size of the moon varied and, since 2014, how its angular distance above or below the ecliptic changed. From the first set of measurements I can find a value for the anomalistic month, and from the second I can find the draconic month. But these are works in progress. There are many small contributions to the Moon’s orbital motion that cause small variations in all of these periods, and the only way I have of sorting them out is to extend my measurements over as long a time as possible. Have patience! This shows the new moon, photographed on August 4th, 2016. 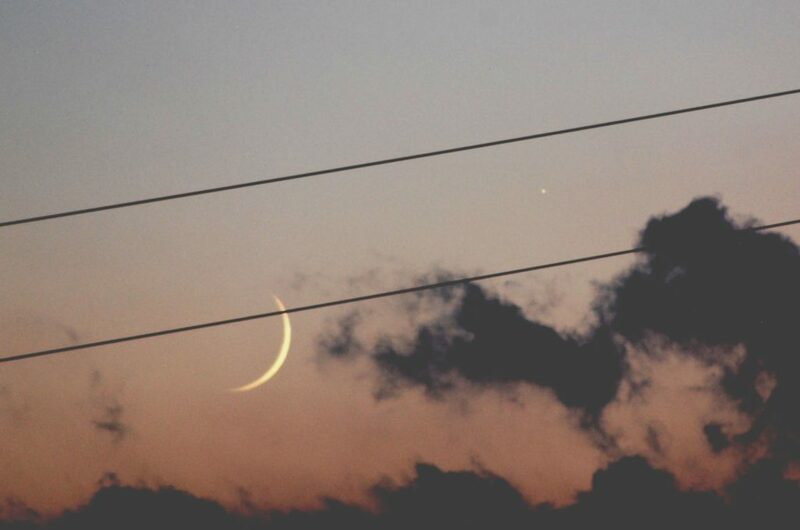 Just visible to the right of the Moon and slightly above is the planet Mercury. Here is one new result. I mentioned at the end of chapter 15 of my book that I could extract the longitude of the ascending node of each of the planets and the Moon from my measurements of the tilt of their orbits. For the Moon in particular, the ascending node is rotating in a negative sense compared with most of the changes in its orbit. I have added two new points to that set of measurements and they pin down the slope of the line much more precisely. 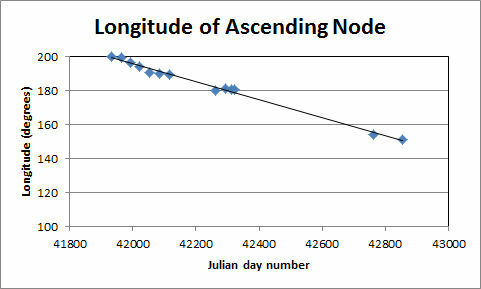 The slope now corresponds to a complete rotation of the line of nodes in 6794 days, or 18.60 years, with an uncertainty of ± 0.05 years. If I combine this with my sidereal year measurement, I get a “back-door” value for the draconic month of 27.212 ± 0.003 days. This is an uncertainty of about 4 minutes. Jean Meeus shows a calculation of the sloping line as Figure 1.c in his book “Mathematical Astronomical Morsels”. My results show small oscillations that are quite similar to the ones in Meeus’s curve, but I am not sure if mine are significant, given the crudeness of the measurements. I continue the measurements of the angular size of the full moon, which I use to calculate the anomalistic month. The current best fit of a sine curve to the results gives a value for the month of 27.559 days while the “backdoor” route of combining the super-moon period with the synodic month gives 27.558 days. The only numerical error in my book that I have found is that I mistyped the handbook value for this month. It should be 27.5546, so my values are closer than I had thought.